Gunther, my childhood stuffed dinosaur, is the main character in many of my projects. Because he is small and innocent-llooking, I find that he is easy to place in uncomfortable situations. 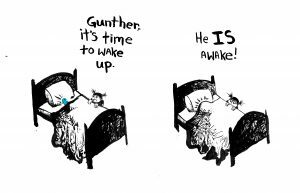 Gunther Get out of Bed is my final project for Experimental Kids Books. For a kids book to be considered “experimental”, the book must have some aspect of being non-conventional in form, content, or subject matter. I chose to address the subject of Depression, while maintaining a conventional kids book form and appearance. 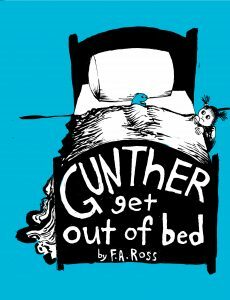 As the story processes, Gunther consumes the page, while the main character tries to get him out of bed without success. 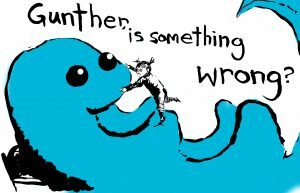 This serves as a metaphor for depression and calls into question if Gunther is experiencing depression, or if the main character is projecting her own feelings onto him, blurring the lines between what is real and what is imagined. In creating this work, I am trying to convey the weight of mental illness from two points of view: from the person experiencing it firsthand, and from the person who is powerless to help. This work was created inking techniques learned in 2D studio. Contours and forms are suggested using masses of lines and texture. Coloring was done using Photoshop.